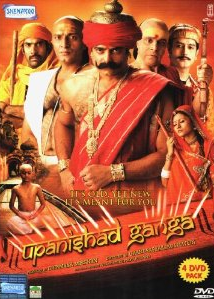 Episode 9 of Upanishad Ganga explores the tale of King Harishchandra. Known for his respect and love for truth and Dharma, Harishchandra is respected for his qualities since long. Today also, when anyone is talking about truth (in India), he refer Harishchandra in one or another way. The Hindu mythology talks about four ultimate goals of life, Dharma, Artha, Kama and Moksha. The brief description of these goals is explored through the narrator via thoughtful dialogs and is worth to watch. This episode talks in detail about the first of these four, Dharma aspect(purusharth) through the story of King Harishchandra. Once upon a time, sage Vishwamitra was doing his ultimate tapasya (a kind of chant.penance to explore the inner peace and know the real and final truth) in the deep forest. He was accidentally disturbed by king Harishchandra and his troop which was on a hunt in the same forest. Vishwamitra got furious on Harishchandra and considered him responsible for ruining his long running rituals when he was almost to get results for the same. He was about to curse him when Harishchandra pleaded him to not do so. On a note, there are other versions of the story as well. But, the ultimate thought you may come with is, if the person, is unable to control his emotions of anger after so many years of quest for the inner peace, it must be really tough. And, when someone else can make you lose your control on yourself, you are not in your control; you have a very long way to go. To walk on the spiritual (or even the real) path of the life, one should be in total control of him/herself. Ultimately Harishchandra gave his entire kingdom to Vishwamitra as the ransom/penalty of his mistake. But it was not over yet, he still need to pay a thousand gold coins as penalty to Vishwamitra, and he have nothing left with him now. So either he can stop following his path of Dharma, where it is his responsibility to pay the penalty anyway, or pay the penalty. The importance of one’s words and promise explored through some good dialogs in the next scene. Harishchandra then decide to go to Kashi and there he tries selling himself to earn the thousand gold coins. However people considered it too high price to get a bond-labor. As per his wife Shaibya (in other stories, the name is Tara or Taramati)’s advice, he finally decided to sell himself and his wife both, to earn sufficient to pay Vishwamitra!!! Will he be able to earn the target amount? Will the life stop taking more tests of a man following the path of Dharma or even worst time is awaiting for him? What is real Dharma? and why one need to suffer when walking on the path of Dharma? The rest of the episode tries exploring the answers. The content is really good. The script is written really well and the dialogs are fantastic. Mukesh Tiwari is the top performer of the episode. The dialogs of his wife’s character seems dubbed by Jaya Bhattacharya. The sets are simple and effective. The makers took good care in deciding wardrobe for the characters. Rather than follow – larger than the life – path, they followed the realistic approach to decide the cloths, ornaments and other stuff, and it works. The people of current time may not relate to the tale of Harishchandra. The viewers may find it superficial. However the message about the morals and ethics is crystal clear from the episode, and viewers will like it. The DVD quality is good (in sound and visuals both) as the positive attribute. Also, it is no-nonsense, straight forward exploration of a mythological tale done effectively, embedded with good narration.